Members of the Common Council, elected officials, department heads, city employees, and most importantly, my fellow citizens, I am here this evening to present you with the annual state of the City Address. To all of you joining us at home, we are continuing our commitment to be innovative and I am bringing you this official City Hall update on line. Whether you are watching on Nutmeg TV, on newbritainct.gov, or on Facebook Live – welcome! I stand here before you on this International Women’s Day to give my fourth address – it’s crazy how time flies & ironic of the day this falls on. Let’s hear it for all the strong women who make this world a better place & honor their vast contributions that shaped the world we live in today. The first address I gave 4 years ago, is much different than the one I will give to you tonight. Our theme for this evening is simple – That New Britain is leading the way. We are leading the way…. From business development to infrastructure projects, innovation, and financial management: we are showing others how a City can adapt and be successful during uncertain times. We have dug deep and summoned the courage to make tough decisions during the past several years; to prioritize our finances and cut back where it was necessary. We’ve been bold, innovative, and tenacious in our pursuit to better our community. We have done an incredible job over the last four years of creatively budgeting and finding solutions to pay for the everyday services our citizens expect—and deserve—all while keeping our costs down and our employees employed. Our recent audit confirms our leadership is working. Our Rainy Day fund is stable. We have been able to save and maintain money in our savings account; and finally have been following our own laws – the requirement to budget for and maintain a 5% fund balance. For the second year in a row the rating agency Standard and Poor’s validated our continued successes and gave New Britain another A+ rating! In the announcement analysts remarked, “We view the city’s management as strong.” The commitment my team has made to building a foundation of solid financial practices continues. Our Department heads are to be applauded. Every day, over the last four years, they have run their departments efficiently and effectively. They have made substantial changes to the way they have been accustomed to operating in order to save money and maintain the services that their departments provide. Let’s not forget all our employees! Their professionalism and pride in the city are unmatched. It is worth noting that every single labor union is now on a high deductible health savings plan—a move that will save taxpayers more than $9 million over the course of the contracts. This was no easy feat and took lots of compromise. But it is a team effort. We are lucky to have a staff who step up to the plate when more is being asked of them. Our citizens and I – thank you. Leading the way is not easy. It takes poise, professionalism, and a whole lot of patience. Since becoming your Mayor- I have held four key guiding principles close. Ensuring all of our children have access to the quality education they deserve. And; transparency – an open government for the people. You are the focus of our every waking moment. This Council and my staff help keep those principles alive every day. There is an old saying, “Patience is a virtue.” That is definitely true when it comes to waiting for your vision to come to life. The renaissance of our city continues this year as phases 4 and 5 of the award-winning Complete Streets Master Plan take hold. When construction breaks ground on these two projects in the spring, work will begin to renovate our Main Street overpass into our signature “Beehive Bridge,” while Bank Street and Columbus Boulevard will be renovated for improved transportation flow. I ask you on behalf of our Public Works Department to have patience with the construction and traffic detours. These phases of the streetscape will continue to connect the puzzle pieces in our downtown re-development. There are many projects you know about already – like Columbus Commons at the site of the old police department. When completed, it will encompass businesses and more than 140 apartments for those people who want to live, work and play in downtown. This development is one of the largest private investments in our City in decades. It didn’t just happen. We led the way in razing the old police department, readying the site, and doing our due diligence to make our vision for this corridor known: CTfastrak is growing and helping to fuel a rebirth of our downtown. Some of the other exciting projects you may not be aware of are happening in the heart of the city as well. Recently, CMHA purchased 227 Main Street. They will be renovating the site and spending millions of dollars to consolidate their programming and bringing more than 120 employees into downtown. Meanwhile, two prominent retail spaces in our City’s center will soon be occupied. The storefront next to Dunkin Donuts and the storefront at the entrance of Szczesny garage have now been built out and are equipped to house small businesses. Feet on the street are what we need to bring downtown back. Small businesses are the back bone of the economy and the more we can help entrepreneurs live out their dreams here in our city, the more it will be known that we are open for business. Our industry is certainly growing. Since taking office in 2013, the city’s unemployment rate has gone from under 10 percent to 5.4 percent, a sign that our local economy is strong and our people are getting back to work. As businesses increasingly invest in their operations and expand or relocate to our City, they bring with them workers and a growing market for restaurants and other services that have brought a buzz to our community. Just look to—Central Park—where we revived a summer music series, launched a farmers market, brought in food trucks, and held many community events and gatherings—all new initiatives that help to draw people out of their offices or apartments. It has also led to our third year of growth for our Grand List. Our 2016 Grand List grew by nearly 1 percent, with the personal property portion increasing by over 5 percent, proof that businesses like Stanley Black & Decker have confidence in the direction of our City to make long term investments in their operations here. There’s also aerospace manufacturing companies like Polamer Precision that are experiencing unprecedented growth after being in our City less than two years. In 2016, the company saw a 50 percent increase in sales. This year, the company’s chief operating officer is anticipating a 100 percent increase in sales, more than $10 million in new equipment, and upwards of 100 new employees to help meet their increased production. Not only are companies like this fueling the economic growth of our City by hiring local, but they are providing philanthropic support for our school system and other charitable organizations. Earlier this year, after a nearly yearlong collaborative effort, we unveiled our Master Transit Oriented Development plan, “Hives of Activity.” With ridership on CTfastrak continuing to grow, we must continue leading the way in capitalizing on the potential for new developments in and around the 3 CTfastrak stations in our City. This plan focuses on our neighborhoods and provides a well-thought out vision for helping to revitalize buildings or parcels that are underused. We consistently asked ourselves: How can we design better walkable, livable and transit oriented areas of the city while continuing to honor the history and various cultures that make the neighborhoods unique? This master plan will ensure that long after my administration there remains a solid vision outlining the steps future generations and leaders must take to achieve our ultimate goal to link CTFastrak areas of redevelopment to other areas of the City and beyond. As I mentioned earlier, one of the major gateways into the city will begin its transformation this spring. The Main Street overpass—one of the busiest bridges in town—will be transformed into a colorful and welcoming piece of functional architecture. This bridge will help mend the divisions made to our City when the highway was put through it during Urban Renewal of the 1970s. It will reshape the experience for pedestrians walking between our downtown and Little Poland area, while greeting motorists with a bold message that speaks to the City we have become: an “All America City” that continually sets the bar higher and higher. We want them to exit the highway and “Experience the New” that we offer here in New Britain. If that slogan sounds familiar it should. In January, we unveiled our new city logo and slogan. The last marketing campaign for our City was done more than 30 years ago. This was a long overdue effort to better market ourselves and tell others the real story that’s unfolding. This logo won’t replace our City seal—which depicts the beehive and seven buzzing bees that are representative of the seven founding manufacturers. That seal will always remain. Our new marketing logo is a series of hexagons to represent a hive—or bee in flight—while the slogan “Experience the New” sends a message to the entire state and the region that New Britain is a City that is leading the way and deserving of your time. Whether you are visiting as a tourist, moving in as a new resident, looking to start a business, or staying to continue a career: you are welcome here! One of the insights that came from the group discussions around developing the new logo and slogan is that we are a city full of surprises that range from a world class art institution to a myriad of entertainment options. That includes taking in one of America’s greatest pastimes, baseball. I hope you’ll join me for the first pitch of the Bees’ season opener on April 21st. We broke attendance records last year and our new General Manager Gerry Berthiaume -a former New Britain Red Sox General Manager, would love to continue the streak! It goes without saying we are blessed with gifts from our founding city fathers: beautiful parks and a water system that are to be cherished. There has been much done over this past year to protect these assets. From investing in our park system with upgrades to the continuing investments in our reservoir pump stations and wells. As part of my energy and innovation initiative, the City will continue to take care of its environmental assets and look for new and innovative ways to make the quality of life better for our citizens. Over the last year, we’ve added a fuel cell that powers the high school, launched a new City website, installed LED lights our offices, added free Wi-Fi in our downtown, and started the process to make our downtown traffic lights aligned and smarter. All of these new age changes create savings and are reflective of our goal to constantly innovate and refine how people view local government. 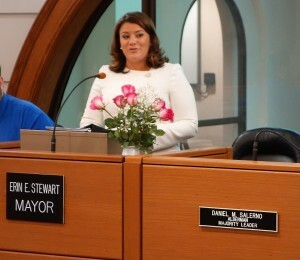 Earlier this year, I restructured the work flow inside City Hall to allow for greater efficiency and uphold my promise to make New Britain welcoming to businesses. A position that was previously housed in the Chamber of Commerce offices has been moved back to City Hall, so that when a developer comes to us, he or she can visit the Building Department to get permits, and then walk down visit with our Economic Development Director to learn about business assistance programs. We eliminated three department head positions in order to save money and we will soon have a new a Support Services Director and Energy and Facilities Manager. These are just a few of the ways in which we are streamlining and consolidating government, while allowing us to continue improving the way we operate. Over at the Board of Education, Superintendent Nancy Sarra has undertaken many of her own new initiatives and is leading the way in trying to eliminate the achievement gap. More students are achieving success because of her hard work and our collective focus on education—as apparent when in June we were given the prestigious “All America City” Award for our results on summer learning loss prevention. We know our schools are in desperate need of additional funding—that’s no secret here. I think I speak for everyone when we say that if we had the ability to fund our school district at the proper amount per student, we’d do it in a heartbeat, but that’s not our reality. I have to give credit where credit is due—Nancy Sarra is doing an incredible job providing a quality education to every student in our district regardless of how much money we receive. We continue to advocate and push at the statewide level for more equitable funding for our students. The next major project on the horizon is the renovation of Smalley Academy. When the project is complete, our 700 children enrolled at the Smalley will have a state of the art building. This will truly be an education hub for the holistic care of our students. We believe in educating and caring for the whole child – with curriculum that also covers health and wellness—and we need a building to provide for all of it – To care for students and their families so they can break the cycle of poverty ensuring that the roof over their head is sturdy. Unfortunately, there are many in our community who don’t have that. Through the hard work with Building Hope Together and all the partners throughout our great City – those who were once without a home – now have a permanent roof over their head. That’s something to be proud of. When I came into this job, we had on average of 108 chronically homeless households in our area, not for one night, or one week, but chronically. In our City, we have a very important milestone to be proud of. This year the state announced that our region had done away with chronic homelessness. Think about that for a moment. Friends, we still have our problems. When we lead, everyone wins. I’m far from finished with my work: I am committed to seeing through the visions that I share with all of you. We have a tough road ahead. The state is in a financial firestorm and what’s happening at the Capitol will soon become our challenge to address. It’s unclear what kind of monetary support will be there for cities like New Britain. Which is why, I am focused on doing more with less and putting together a budget that is fiscally conservative and realistic. Now more than ever, we need to start thinking outside of the box. With over 52 percent of our annual operating budget coming from the state of Connecticut, we need to start thinking bigger and being more resourceful so we wean ourselves from state aid. Though the City may be decades away from that reality—taking bold steps to start that process is why we lead. We have cut to the bare bones—to the point that if we cut any more, our citizens will start to notice and feel the lack of services. Our seniors should be able to afford to retire in the city. They should be able live out their golden years here at home with their grandchildren close by. While we often paint a rosy picture, there’s a lot that is lingering underneath that has been neglected for far too long and that we can no longer avoid—they are decades old issues: outstanding debt and liabilities, rising pension costs, increasing mandates, and more. We will need to come together and find innovative ways to pay for these unavoidable costs. That means some tough decision making is going to have to happen again. We need to generate more revenue—but we can’t do it on the backs of taxpayers. We will seek ways to go after those who have not met their obligation to pay their taxes, we will ask non-profits and tax-exempt institutions to contribute more to our community, and perhaps we will cut back on some of the in-kind services we have offered on our dime to organizations for decades. If we were able to fully tax all the entities in our City that are currently off our tax rolls, we’d stand to gain an additional $40 million a year. Imagine that? Our situation is no joke and something not to be taken lightly: it requires constant monitoring and decision making that considers the consequences years down the road, all while trying to achieve savings in the short term—a complexity that’s not easily executed. Despite the gloomy picture at the Capitol, there are many bright spots and many more successes and accomplishments still to be had. In the weeks to come, spring will be here and Central Park will once again be bustling with activity. New businesses will be opening and construction projects will begin—adding to the growing hum of our City. New developments and innovation will bring an improved way of life and opportunities to make ourselves stronger. We are a City of immense talent and potential, the results of which we are seeing every day across our City’s landscape. We’ll continue leading the way and show others how New Britain is undergoing a transformation that has no limits or bounds. The state of our city is strong and with your continued support we will continue to lead the way for years to come!